Ashford Borough Council Case Study - Learning Nexus Ltd.
Ashford Borough Council is a local authority in the Kent area which provides services to 125,000+ residents in Ashford, Tenterden and a large network of surrounding villages. Their services include; keeping the streets clean, collecting rubbish, social housing, providing leisure facilities and play areas, as well as processing council tax and housing benefits. The council employs more than 400 people and is only one of four local authorities nationally to be awarded a Beacon Award for promoting sustainable communities through the planning process. 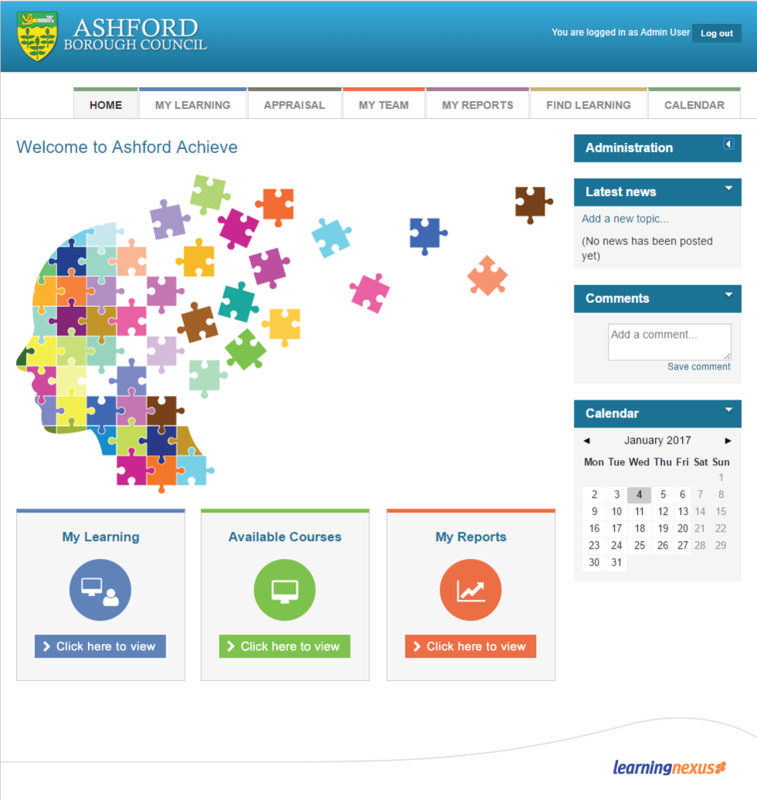 Ashford Borough Council is a long-standing customer of Learning Nexus and required a Learning Management System (LMS) with off-the-shelf content to support their learning & development function. Having assessed various options, Ashford Borough Council decided that the NexusComply (Totara Learn) was suitable for their needs, with modern functionality and capabilities that would allow them to develop the skills of their workforce. The main element the council required was a robust reporting system. Previously, L&D staff were spending countless hours producing reports by hand and collating information from different spreadsheets. They also needed a system through which they could streamline the booking of face-to-face training, rather than manually scheduling events for staff through Microsoft Outlook. Since implementing the NexusComply solution, the sophisticated reporting function has eased the stress of month-end reporting – saving the team hours of admin time and helping to produce much more in-depth reports. In addition to reporting, attendance rates for face-to-face sessions has improved, this is all down to the automated reminders within the system rather than their previous method of using Microsoft Outlook calendar reminders. Not only has it saved the L&D team time, it has also brought compliance to the forefront. Previously the team would manually check training records to ensure compliance, but now it is front & centre of their dashboard. Compliance is now also visible to Managers, ensuring they take greater ownership of their teams training. “As a council we had been using Learning Nexus for our eLearning provision for some time. Upon joining the council, I was looking for a different solution in terms of an LMS – one that would encompass the need for secure data records and user information retention. This coincided with LN becoming partners with Totara, leading us to believe they could deliver a solution which would meet our needs. I needed an LMS that would allow me to have all user records in one place and accurately record all learning, not just their eLearning. This in particular was to cover our mandatory learning requirements, but also for the more generic job role training. I had previously implemented an LMS with another organisation and the experience with LN was so much smoother and supportive. The whole implantation was hassle free, I was amazed by how little I was asked to do! Sell in to the Managers was very quick when they realised the benefits the system gave them, the data they were asking for previously, was now at their fingertips. Staff love it too – it is now so easy for them to find training, be it face-to-face or online. We’ve gone from not really knowing what our compliance rate was, to now having a glance at it on a daily basis – currently running at 95% which is a massive improvement. All in all, it has been a great experience working with LN to implement this great solution”.